Yes, DataMaster Part 2 is an elective course for both the Master Black Belt and Lean Master programs. Tools you will use include R programming language. Part 2 of the DataMaster program is a one-week offering designed to dive deeper into analytic tools for the data analytics student. 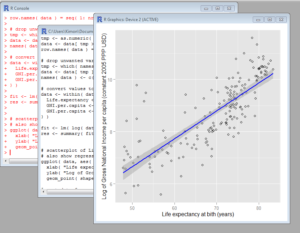 Through the continued use of the analytic methodology delivered in Part 1, DataMasters learn how to use advanced tools such as the R programming language to perform advanced modeling techniques in a more sophisticated manner. Upon completion of Part 2 of the DataMaster curriculum, students will have an opportunity to take an exam for certification. DataMaster Part 2 should be taken in conjunction with Part 1. With this advanced toolset and training, certified DataMasters gain advanced skills required to analyze data, build models and create powerful visualizations that lead to valuable insight and better business decisions. I am a data geek to the core and enjoyed every minute of the DataMaster class. I found it valuable immediately in applying what I learned to business problems requiring a data-oriented solution when I returned to the office. Upon completion of Part 2 of the DataMaster curriculum, students will have an opportunity to take an exam for certification. DataMaster Part 2 should be taken in conjunction with DataMaster Part 1. Questions about the course or want to learn more? Contact our Data Analytics team. The R programming language is widely used among statisticians and data analysts. R is a flexible, powerful language that is free and open-sourced and operates exactly the way problems are thought out. This makes it easy to learn and understand and the open-source platform makes it easy to find help when needed. DataMasters will be exposed to the language, commonly used code and ability for data mining and analysis.